I have been silent again for a while, and the reason for that is mostly that I don’t feel I have anything to say. It is not a good feeling but definitely one powerful enough to keep me away from the computer. 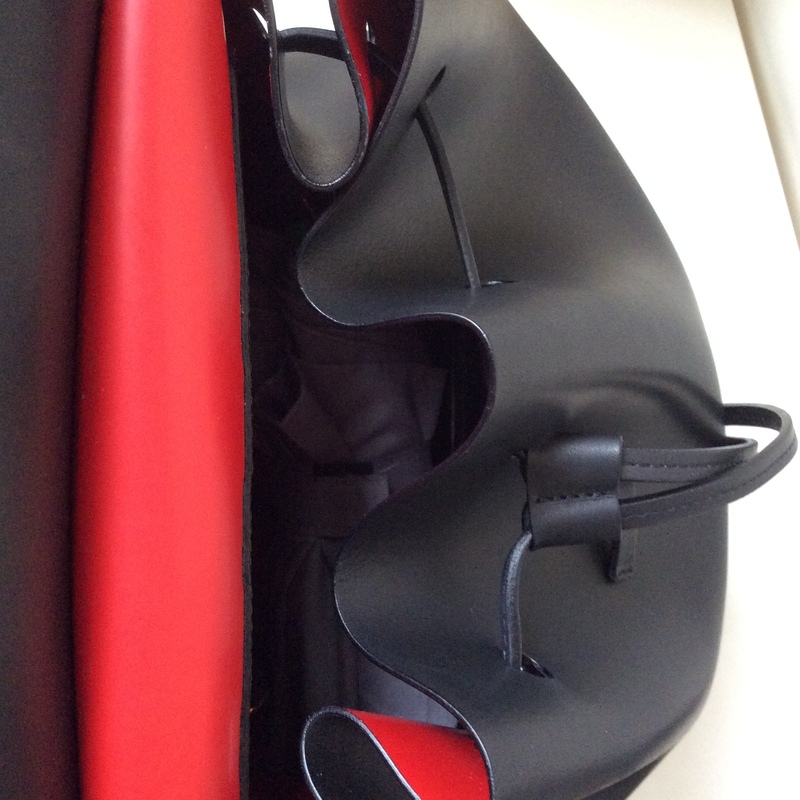 A drawstring closure without any hardware and a peek at the gorgeous inside colour (it is a special kind of paint coating over raw leather. 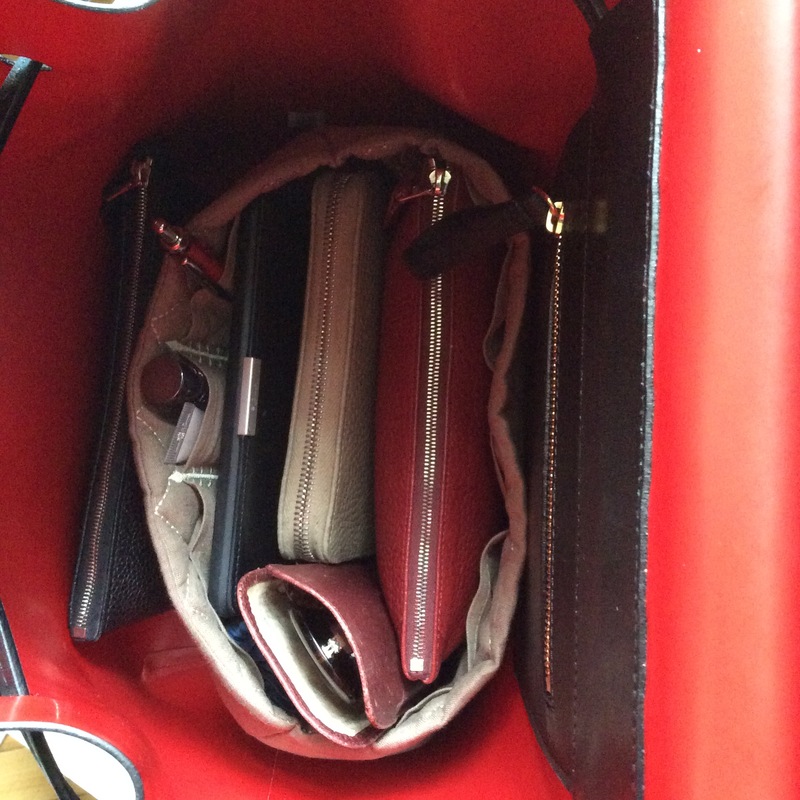 A peek inside: I use a MaiTai Collecion insert to protect the bag and organize my stuff. The Bolide insert is a perfect fit! How are you doing? Do you know this kind of procrastination/don’t start writing problem? 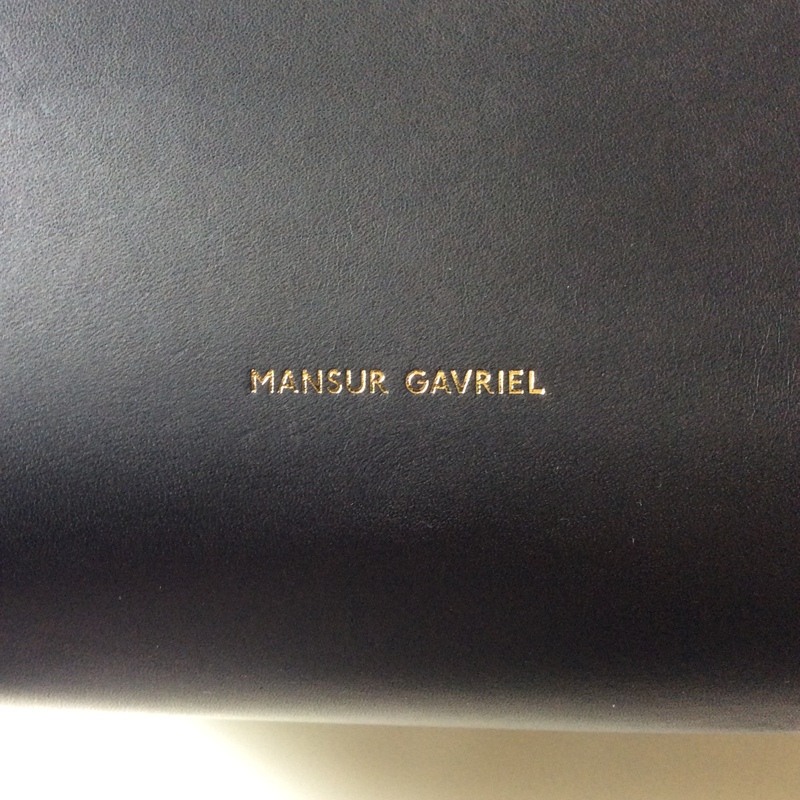 This entry was posted in Ramblings and tagged backpack, bags, handbags, Mansur Gavriel. Bookmark the permalink. Love the backpack! 🙂 Exactly what I would look for if I were buying one (I’ve been considering getting one). Nothing much happening here, I’m trying to run more (more than once a week) as my energy levels are way too low so I completely understand the problem with getting yourself to a computer and writing. 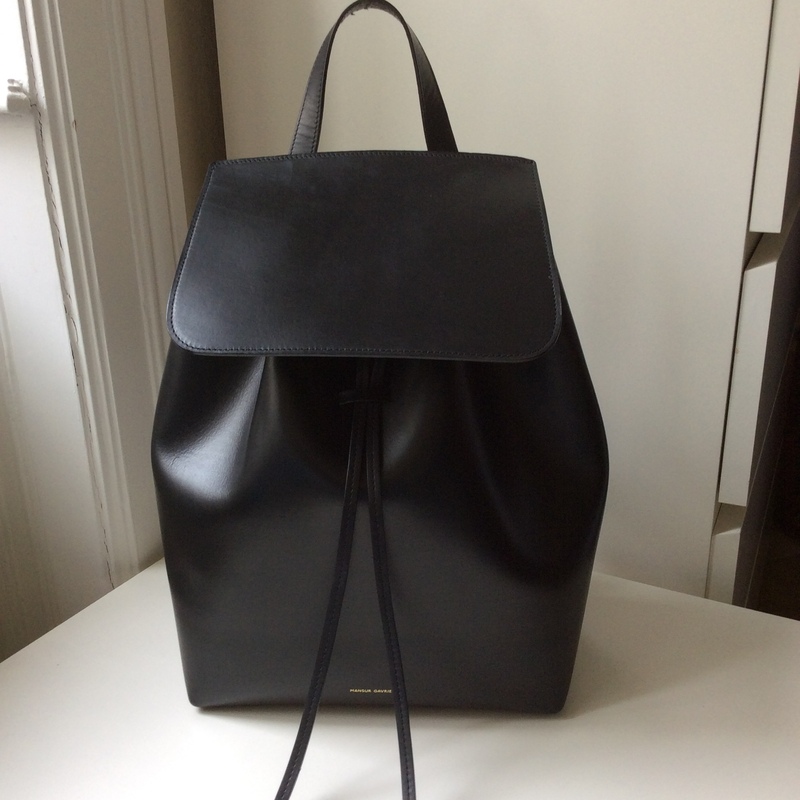 A backpack like this would suit your style so well, Ines. Oh, Birigit, I missed your birthday post! Alles Gute nachträglich zum Geburtstag! I think with procrastination you are in excellent literary company, authors like Kafka, Proust, Charms and Thomas Bernhard (in Beton, Rudolf ponders on the ideal working conditions through several pages..) cultivated it and saw procrastination as a mode of a self-determined life. Thank you Anka, such kind words! Have a wondeful weekend too! That backpack is brilliantly stylish and practical. What a help while you’ve been on crutches. The timing couldn’t have been better. Oh and how much do I love that bright red lining? A lot. I’m going to check out Mai Tai’s Collection for a bag insert. Seriously though, my mum never procrastinates and I SO wish I had inherited that gene. The writing/creating procastination bug is hitting me often and hard, so I think I know how you feel. I haven’t written anything for a bout a month now, and feel bad about it. OTOH, it’s meant to be fun and not a chore, so if things don’t feel right I try to wait it out. Usually something comes along that sparks my motivation. Be gentle to yourself. Good advice, thank you, Sabine. Ah, ad the new thing in my life is the landscaping in our little garden. New decking, new furniture, new BBQ. So now only the English summer has to stop procastinating. Sounds like a beautiful project. Hopefully the weather will cooperate. You bags are always so well organized!!! I guess inserts are created for people like me. I like backpacks very much and usually have 2-3 of them, of course not so stylish. I always look for light-weight bags. And I always travel with my black nylon one (peak of comfort and good size). I didn’t think I was the backpack type, but I love it, so much better for the back too. I’m happy for you, Asali! I love to read your posts. Yes, must be something in the water at the moment, I’ve felt a bit of the same, but for the most part my blogging / writing is just a hobby so I don’t want to force myself into doing it when I’m not feeling it. I always feel it’s just best to follow your moods and just let things happen organically as and when they will. I’ve recently accepted two part time job offers, which I am really excited about. It was pretty odd as I had been going on interviews for about nine months and nothing was really clicking, but then in about the space of one week, I had two offers that both really fit into my current interests so it has renewed my faith that the universe really does have a gameplan! Hope you had a really wonderful birthday and are spoiling yourself appropriately. 😛 Love the new bag by the way! Congratulations on your new jobs! I hope you’ll be very happy with them. Beautiful backpack, dear Birgit. I hope it gives you lots of use and enjoyment. Best wishes as you continue your recovery as well. Love. Thank you, Jim. Big hug! Birgit, I was a born procrastinator, it seems. Yours is only a temporary condition, so no need to feel any guilt. 🙂 And there is always something lovely on your blog, either via you or your other contributors. I greatly enjoyed your scarf series, and seeing this most elegant backpack is a pleasure, too. For me, seeing elegant, beautifully-rendered items of apparel is always an upbeat and inspiring experience. Answering your question, “What’s new?” – I’ve mainly been indulging in buying lots of annual flowers and doing quite a bit of planting. Learning the cha-cha in dance classes that Mark and I have been taking. And, similar to Ines, trying to get my running up to speed. Have a wonderful weekend! I love that you are taking dance classes! Enjoy them! Exactly! It’s a relief for the back and shoulders, I didn’t think I would enjoy that style. I am so happy that you are madly in love with your bag. It’s a winner. As to procrastination, I don’t call it that. I call it percolation and have to build it into my timings for everything. What happens is this for me: I get a job or have a job to do, I think a while on that job and then I get busy with other stuff. THEN I have an idea for that job, then I get busy with other stuff again (books, cooking, movies, cleaning, phone, facebook, whatever), as I’m doing all this other stuff my brain is percolating my ideas, adding & subtracting, working out the rhythm and game plan. Finally, my mind tells me to stop doing the other stuff and sets me to where I need to be to get the stuff done. Then I almost always know exactly how everything needs to be done and processed and put into place. It’s uncanny and I have to let myself go to it 100% or it doesn’t work. So my mind is brewing the idea while I’m off with the fairies. Once i get to do whatever it is my mind has already done the hard yards and all I am now is a conduit for the actions to my finished product. Also, most importantly: you could never bore me, dear P.! We’ve got you Birgit. Don’t stress. This sounds very clever, thank you very much for explaining it, not boring at all!! I am really going to give this a go, it fits with how I understand the mind works but I could not think of a sound way to apply that. Portia, a technical question, when you have the first idea, does that ‘come’ to you (out of your unconscious mind way as the rest of the process, after a first stage of percolation) or do ‘you’ think of the idea as you do when you think about the job at hand (the first step)? It can happen either way. Sometimes the idea is already waiting and you need to spend some time refining it behind the scenes, other times it needs some creative time. The only rule is that you let your brain figure the time constraints, it knows when you need stuff done by. Thanks for reading my comment, really thinking about it and replying, I’m pleased to have resonated. Above comment was in reply to Portia. Birgit I thought that besides natural cycles maybe your loss (of inspiration) smelling and reviewing lots of new scents because of your allergies is also a factor in this. Maybe you need to find a new muse or a muse needs to find you! 🙂 Every woman should have at least ONE backpack! 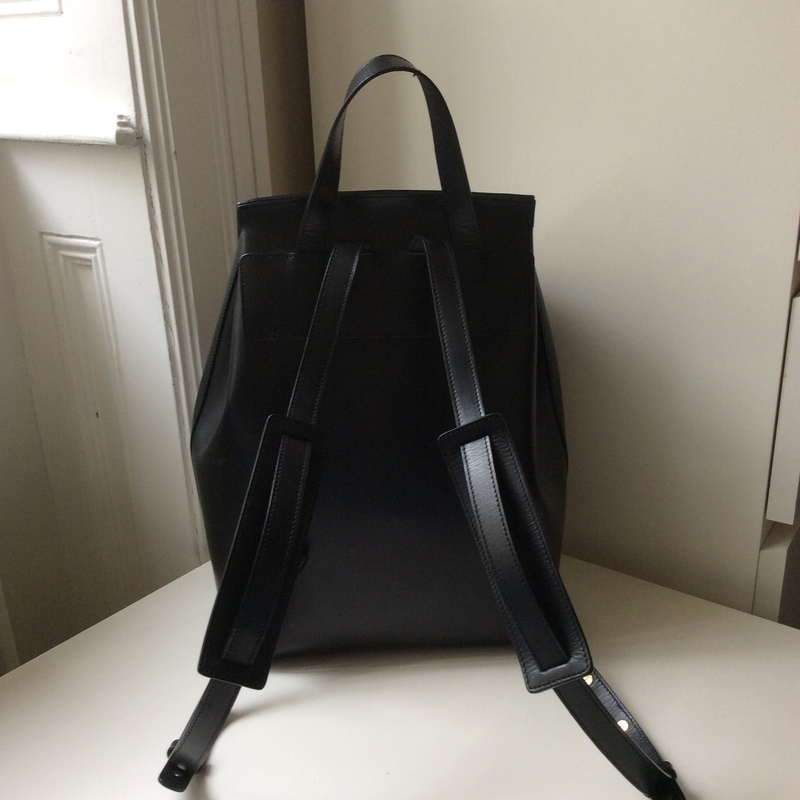 A very fine and elegant bag – the term Ruecksack doesn’t do it justice! As another commenter said, I prefer lighter backpacks for carrying any major amount of stuff, but as you are hobbling about at the moment, it does a great job as a substitute handbag. I have been busy with work and gigs, and off to a small festival in the country today, taking my wellies! Don’t worry about the writer’s block – much better to wait till the muse strikes you again than force it. Have a good time at the festival! I love my MG. I bought a saffiano bucket. Saffiano is so durable, a very good decision. Enjoy your bucket! Hello, Birgit, I am always happy when your posts appear in my reader so waiting makes them even more appreciated. 🙂 Your new pack is lovely on the outside and an organizational marvel on the inside. I find that when I suffer a physical trauma, my emotional and mental self also suffers, so I need time to sort things out in my mind while the body heals. The opposite can also be true. If I have a large emotional upset, I often have a physical response such as flu-like symptoms or a rash. Sometimes when I am healing from an injury I feel disconnected or at a loss for words. In those moments I give myself over to a bit of silence and wait. I try to think of that as my “healing space.” I hope that makes sense, and I hope you are feeling better every day. Thank you for your encouraging words, I’ll take them to heart! Whatever you do, don’t allow any false sense of guilt or obligations to make you feel bad. You’ve built around your blog the community of people who keep coming back once a day, once a week or a month – whatever your naturally occurring schedule is – and regardless of the topic you chose. My procrastination usually happens in the work area. As to my “extracurricular” writing, I have a slightly different problem (though with the same outcome 😉 ): When I’m stressed or tired, I cannot write. I know about what I want to write, I might even have something started. But I would sit in front of the Word window trying to find words – and nothing. But since I don’t think anybody would really notice if I post once every 10 days (or 15?) instead of once a week, I try not to contribute to my stress and wait until words come. I like your backpack! It’s very stylish and practical – and not only for the situations that require hands-free purse operations (please get better soon!). I should probably look into getting myself a backpack: with the amount of things I keep hauling along everywhere, it might be a wise choice. Glad you like the backpack, I could imagine such a style would suit you very well too!